Acute Respiratory Distress Syndrome (ARDS) is characterized by severe shortness of breath and a rapid heart rate, often accompanied by cough, fever, chest pain and bluish lips or fingernails caused by low O2 levels. ARDS can be triggered by direct injuries to the lung such as pneumonia, aspiration, smoke inhalation or blunt trauma, as well as indirect injury such as sepsis or an adverse drug reaction. These injuries damage the alveoli, which inhibits the gas exchange necessary to maintain blood oxygen levels, which can in turn damage other vital organs. Risk factors include smoking, obesity and alcohol abuse, as well as medical oxygen use, surgery and chemotherapy. ARDS presentation is similar to that of heart failure and may be diagnosed initially as pneumonia or pulmonary edema. Most ARDS treatment requires hospitalization and includes oxygen therapy, as well as ventilator support and diuretics. In most cases, a chest X-ray is necessary for diagnosis, but capnography can help determine treatment in the pre-hospital environment. 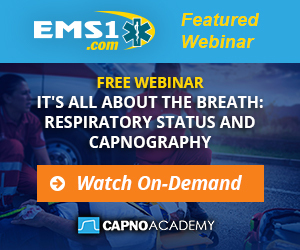 When added to a thorough history and physical exam, waveform capnography is a valuable assessment tool to determine the cause and severity of a patient’s respiratory distress, to guide treatment decisions in the prehospital environment and to monitor the patient’s response to those treatments. Quantitative waveform capnography can serve as an accurate, noninvasive parameter to help EMS providers to gauge the effectiveness of therapy. Extracorporeal membrane oxygenation is a common treatment for ARDS. Paramedics are increasingly likely to transport patients on ECMO machines that provide temporary support of cardiopulmonary function by siphoning blood for O2/CO2 exchange and returning the oxygenated blood to the patient’s body. Capnography can assist in determining the efficacy of this exchange. ARDS patients can be challenging transports. Much of the available research applies to the controlled hospital environment and not the unpredictable transport environment, but understanding current ventilator strategies as well as your own program’s capabilities and limitations will improve chances for a successful transport and patient outcome. Capnography can help medics monitor gas exchange and work to maximize oxygenation in the ARDS patient, whose compromised lung tissue struggles to maintain normal CO2 levels in the blood.